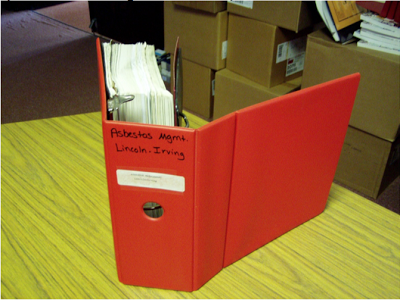 The Asbestos Management plans are housed in a large 4” red/orange 3- ring binder at each building. Allendale Facilities office has a duplicate binder for each building. By law these binders have to be located and updated at each building and should be kept in the main office. Pursuant to Public law 99-519, commonly known as the Asbestos Hazard Emergency Response Act (AHERA), Moline School District No. 40 is required to provide notice of the Environmental protection Agency (EPA) requirements pertaining to 40CFR763 subpart E.
This notification is to inform all staff, patrons, parents/custodians/legal guardians, students, collective bargaining organizations, parent-teacher-student organizations and other "short time" users, that the Management Plan, per Statute,for.Moline.·School District No. 40 is available for review upon request. A copy of the complete Management Plan for all facilities operated by Moline School District No. 40 is available for review in the Administration office which is located at 1619 11th Avenue, Moline, Illinois, 61265, telephone (309) 743-8128. Plans for a specific school are available in the office of the Principal of that school. The Management Plan may be viewed by any person during normal business hours. Please call ahead and schedule an appointment so that administrative personnel can be available to answer your questions. Persons with inquiries concerning any portion of the Asbestos Management Plan should contact Darryl Snyder, Director of Facilities, at the telephone number above during regular business hours.